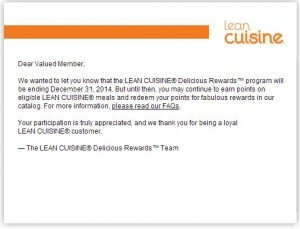 We wanted to let you know that the LEAN CUISINE Delicious Rewards program will be ending December 31, 2014. But until then, you may continue to earn points on eligible LEAN CUISINE meals and redeem your points for fabulous rewards in our catalog. For more information, please read our FAQs. So much for this one! Could we see the end of other programs in 2014? Perhaps MyCokeRewards? Only time will tell. Author vvhitekid2Posted on July 6, 2014 August 30, 2016 Categories Customer Loyalty Programs, Lean CuisineTags lean cuisine, shutdownLeave a comment on So long, Lean Cuisine! Lean Cuisine Delicious Rewards – Free codes! 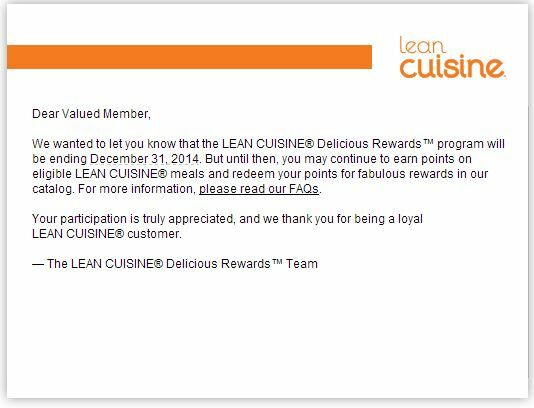 Lean Cuisine seems to have joined the trend of code-based customer loyalty programs with their “Delicious Rewards” program! Lucky for us – now we can get healthier while we earn and share codes. In an effort to reduce how much take-out I order here in Seattle, I’ll be buying quite a few of these – and like MyCokeRewards, Pepsi codes, and Dr. Pepper, I will be sharing my codes on this page. Yep – free codes. No catch. And I’m hoping there are others out there that may join me in the sharing. Code can be found on the inside of the frozen dinner box. Each code is worth 20 points. 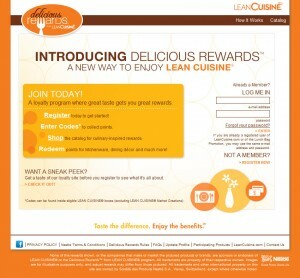 You can enter the codes at deliciousrewards.leancuisine.com. You can earn some extra points by taking surveys and polls on the site. This program is interesting because its one of the first I’ve seen where you earn “Badges” as you go. Badges can be earned in many ways… adding items to your wishlist, referring friends, or simply just trying out new frozen dinners (and entering the code). Fun! The program is scheduled to end at the end of the year, 12/31/2011, but will likely be extended. Comments are held for moderation before they are posted. While we have a very friendly atmosphere here, I keep the moderation pretty strict. It boils down to this: If your comment does not contribute meaningful content to the discussion of this program, it isn’t going to show up. Begging or trading requests will also not show here. Author vvhitekid2Posted on September 11, 2011 July 27, 2017 Categories Customer Loyalty Programs, Free Stuff, Lean CuisineTags delicious rewards, Free Codes, free lean cuisine codes, frozen meals, LC codes, lean cuisine52 Comments on Lean Cuisine Delicious Rewards – Free codes!